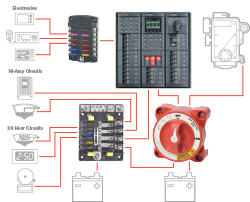 Click on the System Diagram below for a larger, interactive version. Hover over any of the components in the diagrams for links to more specific product information. Click on the SubSystem Diagram below for a larger, interactive version. ABYC limits the number of wires on a single terminal to 4, which can make it difficult to add more electrical loads like stereos, fish finders and GPS. Install an easy access point to add future electrical appliances by pairing a DualBus Plus and a 6006 m-Series ON/OFF Battery Switch. 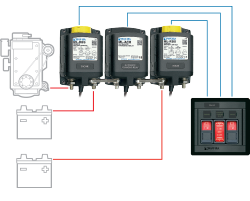 The m-Series ON/OFF Battery Switch offers a method of disconnecting all loads from the battery for storage or in the event of a fire, while the Dual Circuit Plus™ will offer an insulated and compact termination point for both the positive and negative wires when installing additional appliances. 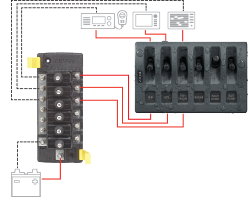 The P12 Battery Charger can be coupled with an Automatic Charging Relay (ACR) to provide advanced charging at or away from the dock. 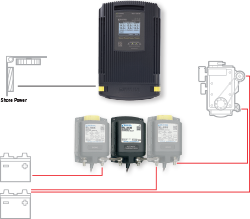 When the P12 Battery Charger is operating, communication with the ACR isolates the batteries so the proper charge profile is applied to each battery. 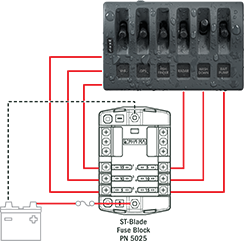 When the AC source is removed, and the engine is running, the ACR will automatically combine batteries to share the charge from the alternator and isolate the batteries when discharging. 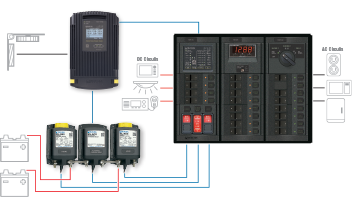 The flexibility of the 360 Panel System provides one central location to monitor, distribute, switch and protect the complex DC and AC system on a boat or vehicle. The new P12 Battery Charger Remote LED Display can be mounted in the 360 Panel to conveniently monitor and control the P12 Battery Charger. 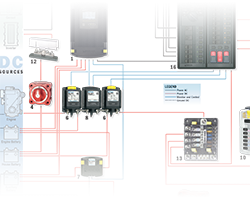 The 360 Panel can also be designed with control switches for the ML Remote Battery Switches and ML ACR for complete battery management with the touch of a switch. 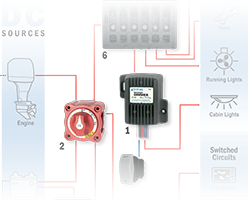 For seamless control of charge management either at or away from the dock, the ML ACR can be coupled with the P12 Battery Charger applying the proper charge from either the AC Battery Charger or from the engine alternator. 360 Panels are available in stock or custom panels that can scale to your needs. For a single battery boat or vehicle, the m-LVD will save power for engine starting. 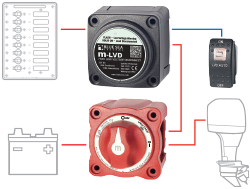 The m-Series ON-OFF Battery Switch provides a disconnect to cut off battery power when the boat is not in use or in the event of a fire. 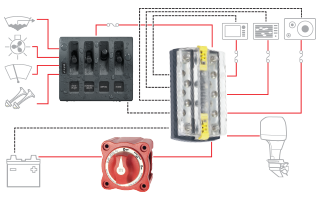 The pairing of the new WeatherDeck® Switch Only Panel and the ST Blade Fuse Block with Ground is ideal for small runabouts and RIBS. These boats often require the waterproof switching of the WeatherDeck® Panel, do not require backlighting, and are operated only during daylight hours. 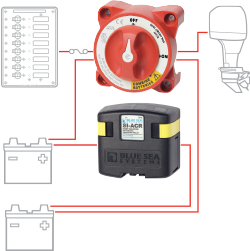 Using an ST Blade Fuse Block allows consolidation of all of the boat's circuit protection in a dry and protected location.